We anticipate sustained revenue growth at Raytheon going into Q1 2019. We believe the market still undervalues the company's revenue growth - this remains our core thesis on the stock. We maintain our Buy - Long Term Hold rating ahead of Q1 earnings on 25 April, with a 3-year base case of $225/share on a total return basis. We will post a review of earnings 2-3 days after the company reports. This is a Cestrian Capital Research “Continuing Coverage” note. Raytheon (RTN) is a core stock for our New Space Race coverage, and it’s a stock we like. We started coverage on 7 February this year – you can read our Initiating Coverage note here >> Long Range Growth Opportunity - The Raytheon Company. We assigned a “Buy - Long Term Hold” rating and identified a potential short-term trading opportunity. The company is due to announce Q1 2019 earnings at 0700EDT on 25 April. 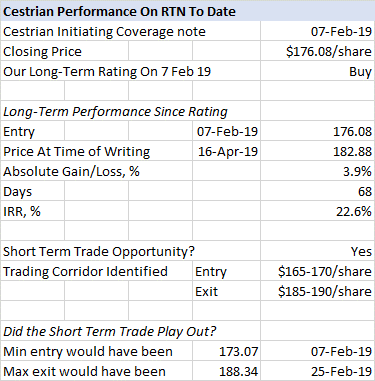 Here we revisit our thesis on RTN ahead of earnings. 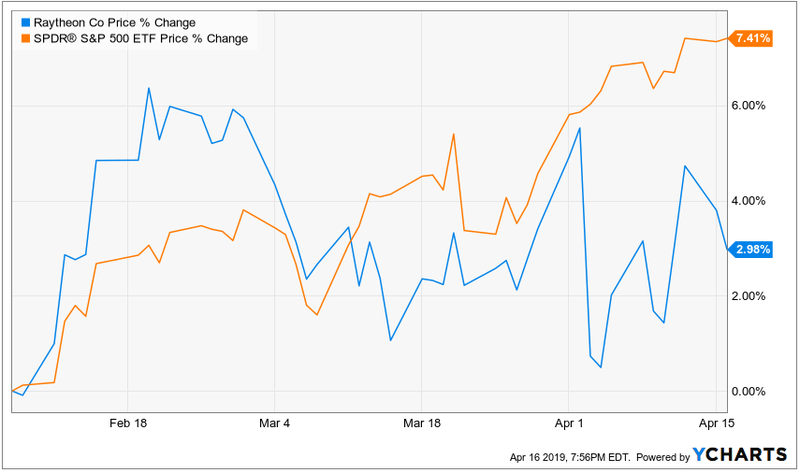 In our recent note covering the pending Northrop Grumman (NOC) Q1 earnings release (here >> Anticipating Q1 Earnings - Northrop Grumman), we set out our approach to earnings reports as regards our long-term buys. (We currently rate both RTN and NOC as Buy - Long Term Hold). For this category of Buy, with a three-year horizon and price target, we consider revenue growth to be the principal indicator of long-term share price appreciation. The EPS number can be impacted by so many factors (one-time charges, write-ups, tax rate changes, acquisitions, restructurings ... etc) that we aren’t in the business of trying to predict it. If the EPS number surprises to the downside, then a long-term grower like RTN usually presents a short-term trading opportunity on the long side. In this note we aren’t aiming to guide on earnings – if the stock over-reacts or under-reacts to earnings in our opinion, and a potential short-term trading opportunity presents itself, we’ll highlight that in our earnings report after the fact. RTN revenue growth should be sustained. All of RTN’s key end markets – space, defense, cybersecurity – are growing well. Space is a priority for the current US administration; the major world powers are going through an upgrade in defense capabilities; and cyber-risk continues to escalate. Save for lower-than-market growth in the smallest division, cyber, we aren’t aware of any reason why RTN would be losing market share particularly, so we anticipate sound revenue growth. Stock price performance has lagged the S&P500 – but RTN is growing faster than the S&P500. Our core thesis on RTN is that its revenue growth is undervalued. 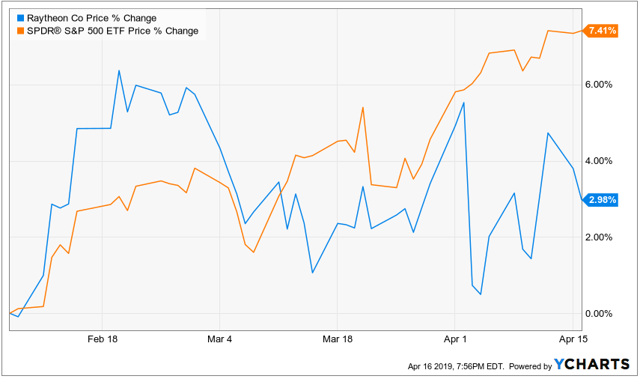 Since we initiated coverage, RTN has underperformed the S&P500 index, despite it growing revenues significantly faster than the index constituents. We believe RTN's EV/TTM Revenue multiple is too low as a result, and that an upward re-rating could follow if RTN continues its growth outperformance. Latent value may be unlocked from Forcepoint over the long term.We continue to expect upside from the Forcepoint cyber division, be it a sale of the division or a material improvement in its performance. This is pure upside, we’d still be at a Buy without it, but we think that management will unlock value from this division at some point and it adds to our conviction on the stock. We unpack the first two points below. We commented on a possible Forcepoint value creation event in our Initiating Coverage note and until more data is presented by management, we have nothing to add at this stage. Again, for our long-term buys, we focus mainly on revenue growth because it is revenue growth that drives long-run earnings ergo long-run stock performance. No management team can deliver long-term EPS growth by simply managing costs – companies need sustained revenue growth to achieve long-run earnings growth. Let’s remind ourselves of the financial track record RTN has achieved in recent years. The most recent full year, FY12/18, delivered revenue growth of +6.7% and an uptick in operating margins of an additional 4% (such margins rising from 13% to 17%). Over the last year, revenue growth has accelerated - that is, the rate of growth of revenue has increased. Quarterly growth vs. the same quarter in the prior year (e.g. Q4 18 vs Q4 17) has increased from +5.3% in Q1 18 to +6.7% in Q4 18. Considering sequential growth in TTM revenues vs PY (e.g. comparing TTM at Q4 18 vs TTM at Q4 17 with TTM at Q3 18 vs TTM at Q3 17 - looking at how a relatively slow-moving indicator performs) has increased every quarter through 2018, from +1.1% at Q1 to +2.2% at Q4. We don’t know of any reason why the growth rate of RTN should have slowed. As we can see above, during 2018 the rate of growth increased every quarter. The consensus revenue estimates for RTN for 2019 assume growth will continue at the rate it exited 2018, which is to say finishing FY12/19 at +6.7% growth in TTM revenues, the same rate of revenue growth as FY12/18 vs. FY12/17. The consensus estimated growth rate for Q1 19 vs Q1 18 is +6.8%, again about the same as the trajectory at the end of 2018. If we assume the same EV/TTM revenue multiple applies - ie. no increase in market rating - and we take the updated shares outstanding number (a slight increase of 240k shares according to Ycharts.com), assume no new debt was issued and a modest $200m net cash was generated in the quarter, the implied share price would be of the order of $179/share based on consensus estimates for Q1 2019 revenue. 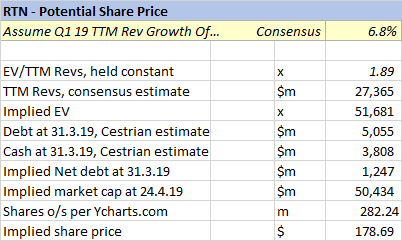 In other words if there is no change to the market multiples at which RTN trades, its stock looks fully valued based on consensus growth estimates for Q1. Absent any other factor, this would cause us to move to a Neutral recommendation. But we think that underplays RTN's long-term potential. In our opinion, RTN’s valuation multiples are low compared to the market, once RTN’s growth rate is factored in. And if we are right, a small change in valuation multiple can deliver a meaningful uplift in the stock price. We explore this below. We think this may be due for a correction, benefitting RTN - for the simple reason that RTN’s revenue growth is materially faster than the S&P’s revenue growth. RTN’s +6.7% revenue growth in 2018, and estimated +6.8% revenue growth in Q1 2019, compares to the S&P index’s +4.6% annual revenue growth achieved in Q1 2019 based on those companies which have reported thus far. (Source: Factset, here). So if RTN hits the consensus revenue estimates for Q1 19, it will be growing revenues nearly half as fast again as the S&P500. We would expect to see that reflected in the revenue valuation multiples at some point soon. 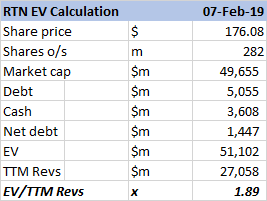 For instance, simply adding 10% to the EV/TTM sales multiple (moving it up to a multiple of 2.08x rather than the 1.89x used in the analysis to date) would deliver a share price of nearly $207/share. (Multiple expansion is a wonderful thing when it works in one's favour, as it can move stocks far more and far faster than earnings growth alone). Since we initiated coverage, the market is up considerably, RTN is we think growing well, and yet its price has risen only a little. We think that bodes well for the stock, as we note above. We will change our ratings if the Q1 earnings report indicates we should. At the moment we maintain our current price targets, being $225/share total return (incl. dividends) 3-year base case, $260/share total return (incl. dividends) bull case, and $185/share total return (incl. dividends) 3-year bear case. How Are We Doing So Far on RTN? Our Buy-Long Term Hold is working out OK so far – we’re 3.9% up on an absolute basis which is about a 22% IRR performance over the period since we went to a Buy-Long Term Hold. (We use IRRs because we cover both long- and short-term long-equity investments and want to be able to compare apples with apples). The company declared a dividend of $0.94/share for shareholders of record as of 10 April. The pay date is 9 May. We will factor that into our total return calculations once we are past the pay date. (Right now it would add about 0.5% to returns on an absolute basis if the stock flatlined from here to pay date). We also posted a short term trade idea in our Initiating Coverage note. We said the stock could move in the corridor between $165-$170/share on the low end and $185-$190/share on the top end in the coming months. Our logic on the top end was that we saw a support-resistance level of $192/share on a simple chart analysis and felt that would be a resistance level before it became a support once more. Revisiting this, we were a little optimistic on the potential entry price – the stock hasn’t dropped below $173/share since we published – but our potential exit was about right – peak was $188/share on 25 February. (Note that at the moment we don’t run a real-time service so we don’t post real-time buy or sell rating changes. This is a service we are considering offering as part of our upcoming Marketplace subscription package, which you can read about below). We will follow the Q1 earnings call and post an Earnings Review note shortly afterwards. On 1 May, we launch our SA Marketplace service, “Investing in the New Space Race”. Live chat & real-time responses to relevant events in the space sector. Continuously updated space market map. Regular coverage and ratings of space stocks. Potential short-term space sector trading opportunities. We will be offering a free trial period, a low starting subscription rate & a substantial discount for annual membership, plus a two week window in which you can cancel free of charge. We’d love to have you as a member - we’ll keep you posted as to how and when to sign up for your free trial.